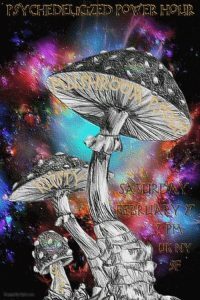 Saturday’s Psychedelicized Power Hour presents “Mushroom Psoup, Rusty’s trip down the rabbit hole. We will be serving up some hallucinogenic psychedelic(s) for our journey, so whether you are feeling tall, or a bit small, join the party. Saturday February 27, 7PM UK/NY and SF times.